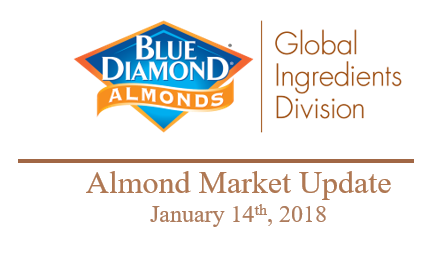 The Almond Board Position report for December met expectations. 2018 receipts to date stand at 2.202 billion pounds compared to 2.207 at the same time last year. The 2018 crop looks very similar in size to the 2017 crop, likely falling short of 2.3 billion lbs. Given a smaller carry-in than last year, total supply will be 30-50 million lbs less than last year. YTD shipments of 1.007 billion pounds, are just short of last year’s 1.038 billion pounds. The domestic market shipments are up 2.44% year to date compared to last year while export shipments are down 5.18% from last December’s YTD shipments. With strong December new commitments of 180 million lbs, total commitments continue to close the gap on last year, now at 568 million pounds or only 53 million lbs behind last year. Globally, demand remains strong as witnessed by ongoing shipments. While this crop year began with high uncertainty due to tariff issues and fluctuating expectations on crop size, buying and selling activity has been followed norms more than was initially expected. The U.S. market continues to grow with 9 monthly records in the last twelve months. Export markets, particularly China and Turkey have been impacted more severely by the uncertainty. While China/Vietnam are off 7% collectively, this market may have been up double digits with normal trade conditions over the summer. With Australia enjoying a duty free relationship with China, they are likely to take a larger share of the January to August shipments. If so, California will likely replace the gap left in India by Australia’s shift. Keep an eye on the ongoing U.S. – China trade talks that could change the landscape yet again. Other notable trends show EU shipments slightly lagging last year’s down 6%, the Middle East/Africa down 5%, with volume shifting from Turkey to other destinations due to high tariff rates imposed on Turkey. There are shrinking price differentials between Nonpareil and pollinizer varieties that are likely to continue this year. Nonpareil demand has been most impacted by trade uncertainty and tariff issues. For pollinizers, U.S. growth continues as almond milk, almond flour, and almond butter add to snack almond and ingredient consumption. Pollinizer prices already reflect an increase similar to that realized late last year. The 2018 supply picture has become more clear. Since October, industry shipments have closed the gap from a slow start due to trade concerns. With eight months remaining, overall supply and demand are relatively balanced and bloom expectations will become the next major factor influencing the market.